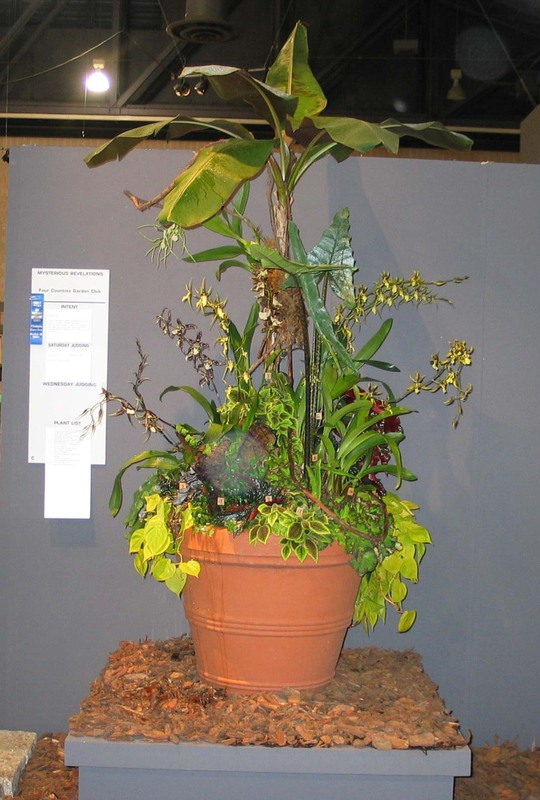 When people ask me how my career evolved in floral design I have to give credit to the Pennsylvania Horticultural Society and the Philadelphia Flower Show. While taking classes and workshops, whenever they were offered, the chance to try my luck in competition was a perfect venue for trying something new. The medium niche was a great place to begin and this class incorporated fruits and vegetables. A taro root balanced the Asian inspired design. Each class at the show has at least four entries, sometimes six, and are judged by panels of judges from across the country. Often I agree with the judges’ comments and often not, but I always pay attention and try to learn from them. Not all of my ribbons are blue! A horticulture entry for Four Counties Garden Club was done with a friend. 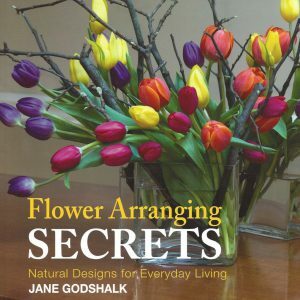 Since we were both flower arrangers, we decided to elevate our brassidiium “Fly Away” orchids and won big prizes. Orchids are from Waldor Orchids and Meadowbrook Farm grew our tropical plants through the long, cold winter. Another Four Counties Garden Club exhibit was a Table Class. A committee of garden club members work together to create a room with a theme. My job was to help with floral design. The urn contains some beautiful branches. 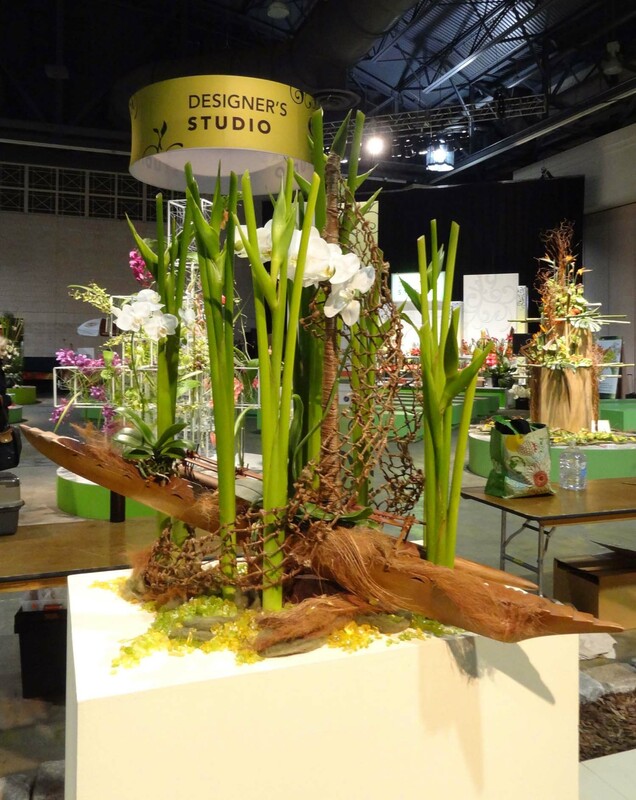 The show theme was “Hawaii” and the class was “Outrigger—A design featuring heliconia.” The beautiful heliconia ‘Emerald Forest’ from Green Point Nursery made a winning statement combined with white phalaenopsis orchids and a shined up miniature canoe. 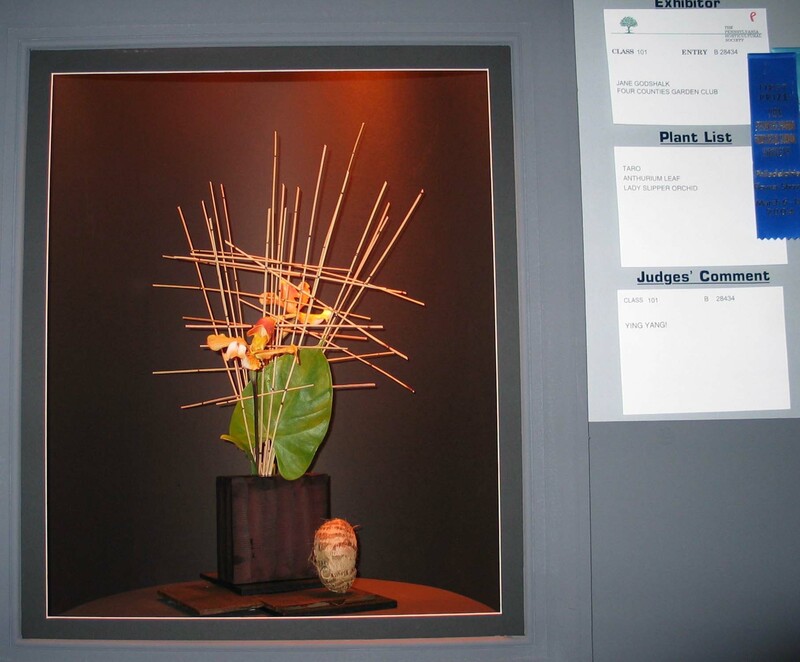 When I passed my AIFD (American Institute of Floral Designers) exam I was inducted into AIFD and have had the great privilege of being part of some of their outstanding exhibitions. Disney princesses was the theme of AIFD and Theresa Colluci and I were assigned Rapunzel. Rapunzel’s yellow packing tape tresses were installed with a cherry picker and yellow oncidium orchids captured the flowing mood. The orchids from Green Point Nursery were awarded the Orchid Society Award. For the show theme of Holland AIFD created and exhibit of Dutch culture. My part was a Flemish mass design using colors of gold, yellow, and red. The parrot tulips were the stars combined with yellow oncidium orchids and red anthurium. The design was over six feet high elevated in a frame and the vase mechanic used three tiers of floral foam in a sturdy wire cage. 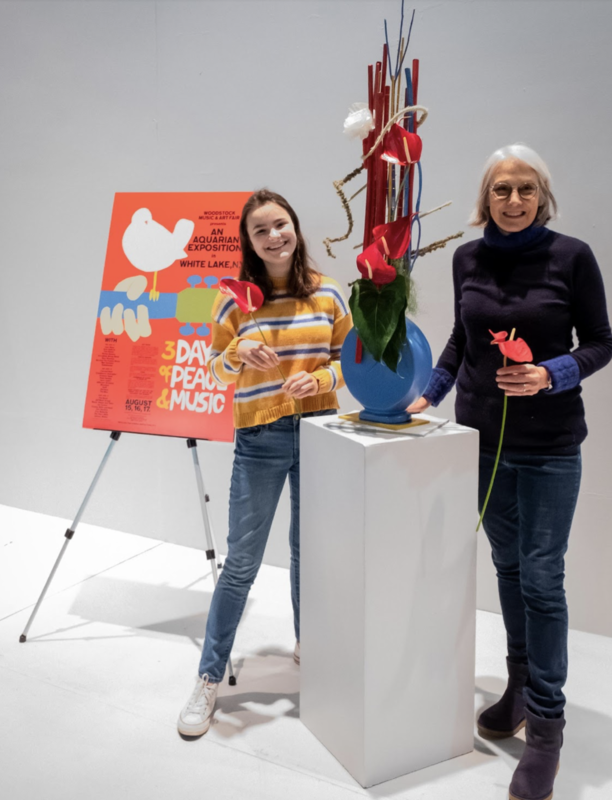 This past Philadelphia Flower Show ‘Flower Power’, my granddaughter, Madeline, and I entered a class in the large space called Galleria. 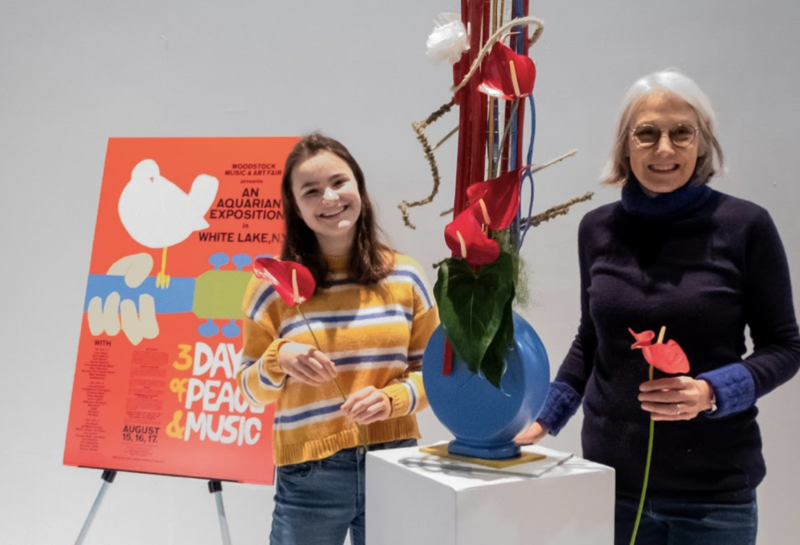 Each of four exhibitors was given a poster from the Woodstock rock concert event. Our poster was the advertisement for the concert and we used a blue vase filled with red fiber sticks, and a few blue and gold sticks to mirror the colors in the poster. Red anthurium and one huge Japanese ranunculus with a white anthurium were our flowers and an anthurium leaf. Although it was not planned, the design looked quite a bit like a guitar. It was a joint effort and hot chocolate and Indian food from Reading Terminal added to the fun. When I reflect on the many years of exhibiting and being part of the flower show I smile at the memories and the friends I have made. Each season brings familiar faces and new ones as well with exciting designs. Many thanks to the Pennsylvania Horticultural Society and the flower show volunteers for this wonderful venue to learn and grow.